Incredible but true: in the last 30 years rise in human population has been the same as in the 1,00,000 years prior to the mid-20th century. 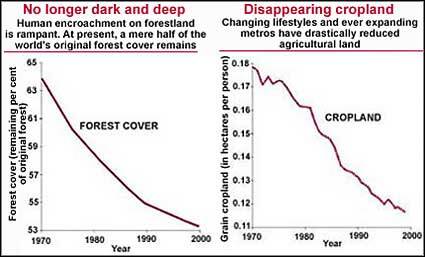 as a result, human encroachment on agricultural and forestland have increased considerably. Particularly because the amount of land used by each person has expanded over time. So, with rising economy, more and more people opt for private vehicles thereby increasing vehicular traffic and hence the need for more roads. Considering the change in lifestyle, cities should be so planned that they do not entail long distances between home, work, shopping and school. Or else we will be putting a great strain on our environment.